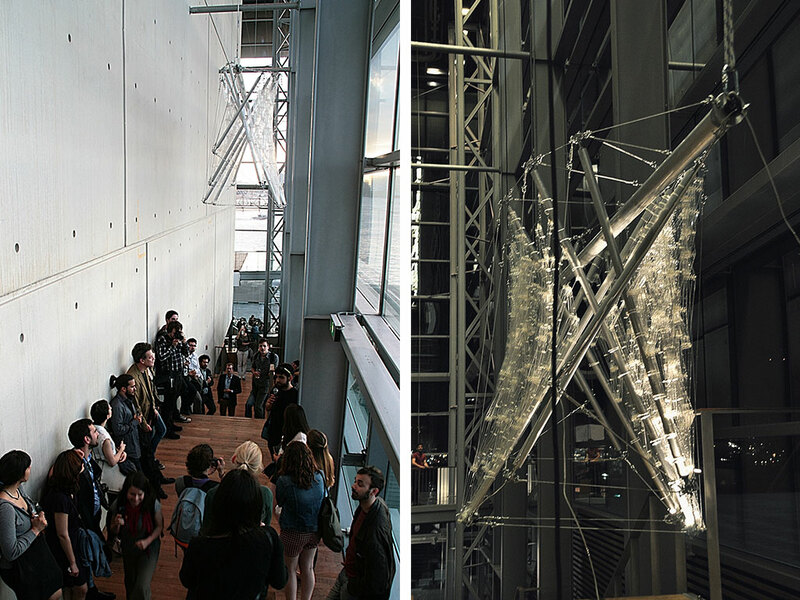 Interactive Tensegrity Pavilion at the FUTURE VISIONS Exhibition, Muziekgebouw in Amsterdam, June to August 2015. The Interactive Tensegrity Pavilion is exhibited at the FUTURE VISIONS Exhibition, at the Muziekgebouw in Amsterdam, from June (end of the Holland Festival) to August 2015, in the context of the 2015 International Association for Shell & Spatial Structures Conference. The selected pavilions for the FUTURE VISIONS exhibition, most of which have been designed by internationally acclaimed university research teams and/or engineering consulting companies, such as MIT, ETH, LOUVEN, UCL, ARUP Japan, ARUP France, Grohman, etc. , according to the exhibition organizers, .. “give a future vision on structural design and innovation and are the outcome of (excellent) structural research”. Designed & Constructed by the Upatras Tensegrity team: Th. GEORGOPOULOS (ALUMNI), A. IOANNIDI (UNDERGRAD), A. KOTSALIS (UNDERGRAD), Ch. NOUSIAS (ALUMNI), E. SPYRIDONOS (ALUMNI). Directed by Prof. Katherine A. LIAPI. The Interactive Tensegrity Pavilion is based on an invented tensegrity configuration that assumes a bounding ellipsoidal geometry than can enclose functional space. 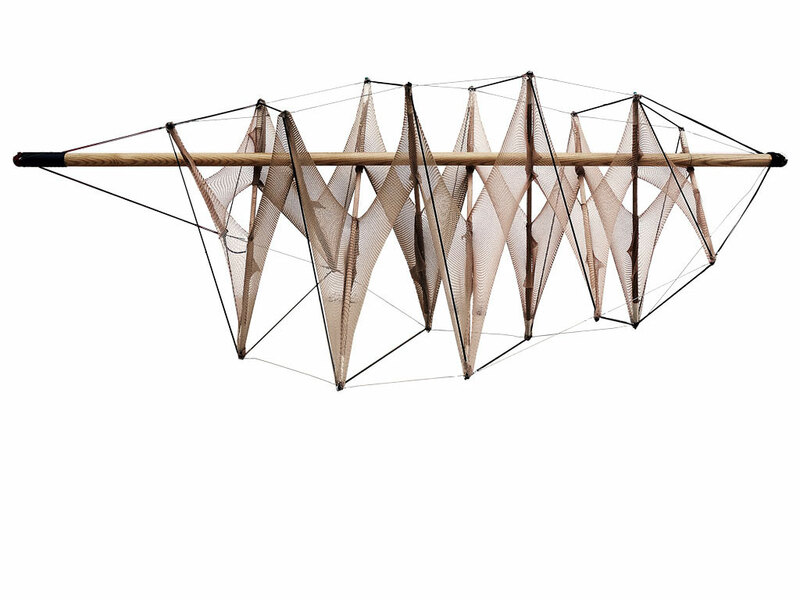 The tensegrity structure serves as the skeleton of the pavilion, while a flexible skin surface, attached on the rigid members of the structure, further confines its space. The structure interacts with conditions in its environment resulting in a subtle deformation of its figure. A basic feature of the geometric configuration of the pavilion skeleton is a long compression member that permits the suspension of the entire structure from two points. Geometric processes and algorithms have been developed to precisely determine the geometry of both the skeleton structure and flexible skin. In addition for part fabrication, parametric processes based on the developed algorithms, have been applied .An efficient deployment and collapse method that facilitates the transportation and the rapid erection of the pavilion structure is also described in the paper.